The Black Rabbit to my utter disappointment (owning to my own assumptions) references none of the above, except for a whim of fancy in the form of the huge bells that adorn the restaurants ceiling. (Love them!) The rest of the décor is rustic with metal and wood boards and potted plants to make it seem like a garden café. 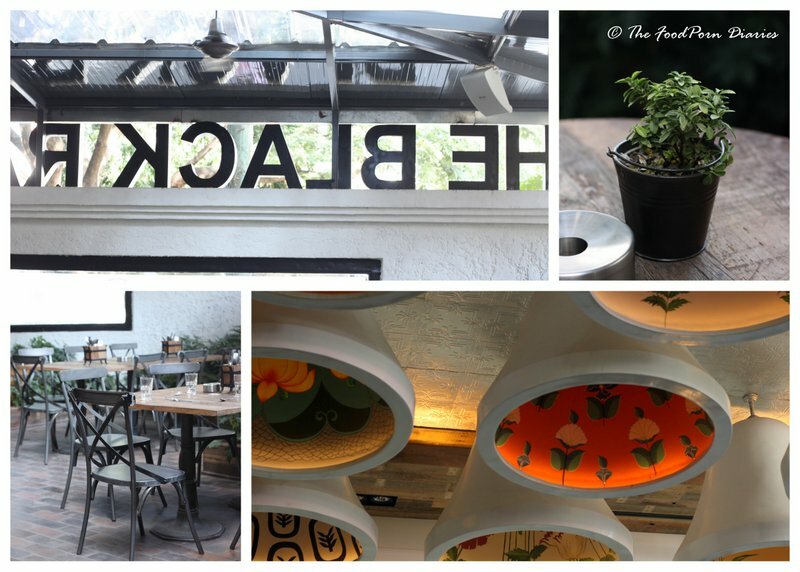 It of course nestles itself in the most busy part of Indiranagar – the Sony world junction. And somehow seems to do more justice to the Escape hotels façade than the erstwhile Sunny’s did. An afternoon lunch with friends is how we landed up there, at half past one on a Saturday. It’s good that we made a reservation, because with every new place in Bangalore – there is always a crowd waiting to ‘experience’ it. Afternoon cocktail hours are also gaining ground in our beer loving city and The Black Rabbit (TBR) had one on almost every occupied table. We weren’t drinking that afternoon (yes, surprisingly :P) so my post is going to be about the food. I do intend to go there one evening for a couple of drinks and lounging about, because I feel the place is perfect for that. The menu is supposedly ‘Continental’, though you will find a Tandoori Chicken, Chicken Tikka, Thai Beef and Quesadillas also making an appearance. They also list Small plates and Large Plates (like it’s suddenly become uncool to call it starters or appetizers!). So from the Small plates section we ordered the Bacon and Cheese Bombs with Charred Chilli Relish because the waiter literally took a bet with us that it would blow our socks off. My possessed friend ordered the Chicken Tikka with Sweet Chilli relish and Sour cream and even our scowls of disapproval wouldn’t deter her. 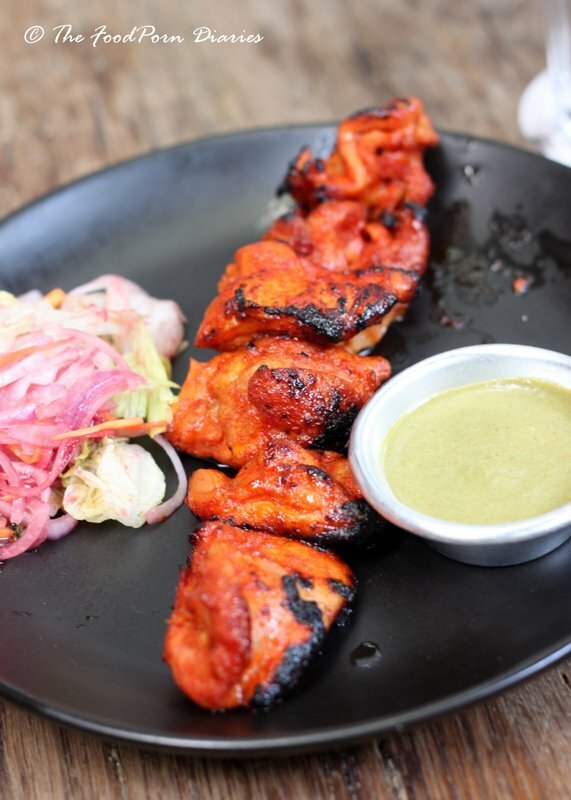 Now I don’t have anything against chicken tikka – but if she wanted a really good one, we could have just gone to Treat on the parallel road. (There IS a place for everything, if not the right time :P). This was fine, in a ok-it’s-orange-and-it-tastes-like-chicken-tikka way. To assuage ourselves of future guilt – we also ordered a healthy salad. God forbid, we don’t have enough fiber in our systems! 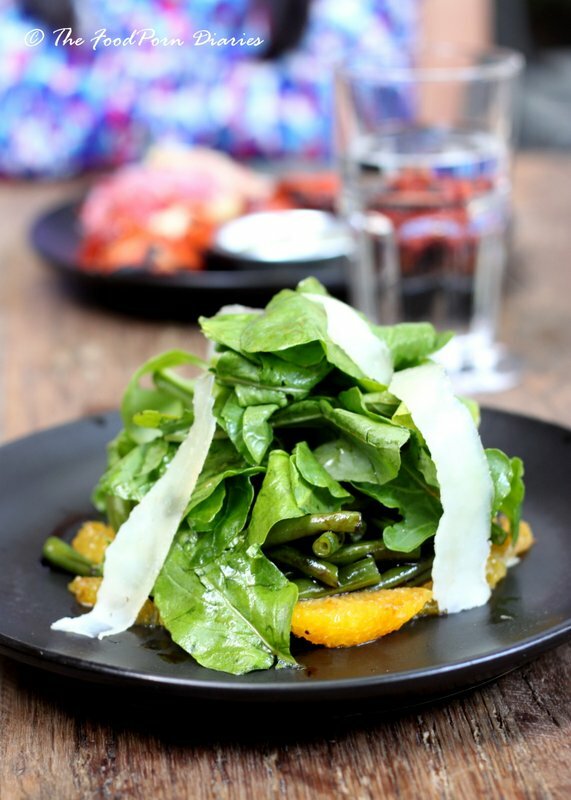 The Green Bean, Percorino, Orange and Arugula Salad with Balsamic Vinegar was true to its name. All the elements neatly piled on the plate and drizzled with the dressing. You really can’t go wrong with this one – unless you served a rotting orange or undercooked beans. So no marks given and none deducted and we all got our healthy fix before moving on to more sinful things – Like the bacon. 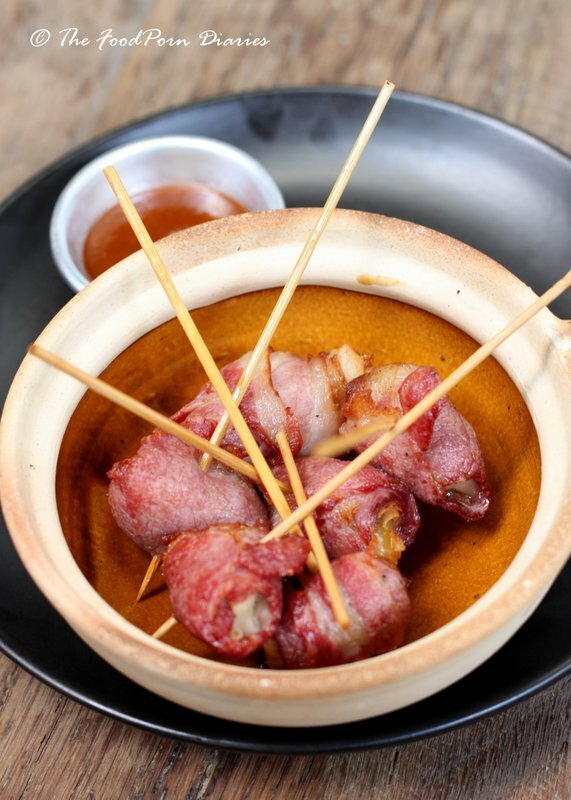 The Bacon and Cheese Bombs turned out to be a deceptively simple Cheese Wrapped Bacon on a skewer. Lucky for them – it tasted absolutely brilliant. Perfectly grilled bacon enclosed melting cheese that when dunked into the chili relish made a perfect December treat. A realistic friend suggested that it didn’t really show any creativity on the chef’s part. But as a bar snack, I think it’s a runaway hit. 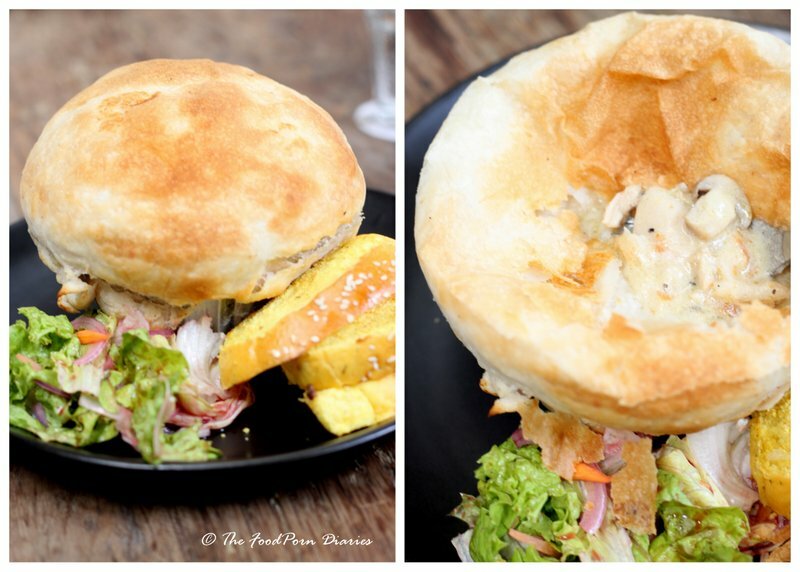 The Chicken, Leeks and Mushroom Pie arrived all puffy and glorious and we forgave the long wait between courses. The menu claims they serve it with a home grown salad – that had onions, carrots and lettuce. We decided to give them the benefit of doubt and believe they grew not only the greens but the onions as well. Once we decimated the pie covering however, the insides were unremarkable. You want a pie to be soulful and comforting – rich with the stock and gravy and tender morsels in every bite. This one looked like it wanted to be on a watery diet – which is good for some people, but that’s not what a pie is to me. 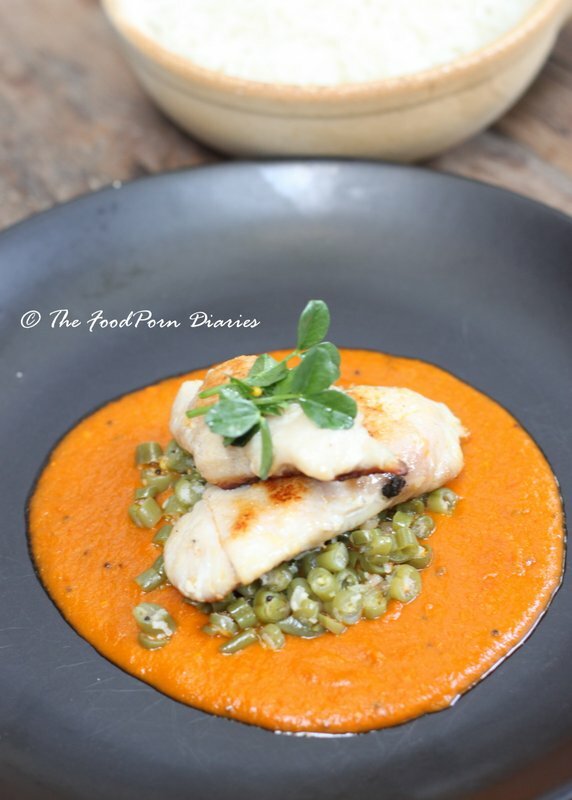 The Pan Seared Halibut fillet with Kerala Curry Sauce, Beans Poriyal and Steamed Rice was always a risky order. Risky because what if it turned out exactly as they so eloquently stated and wasn’t the new age fusion that we expected. The Manager overheard our conversation and came to assure us that it was a lovely interpretation of the kerala curry and we should try it. It failed our expectation precisely because the manager told us that it was an interpretation. What arrived was exactly what the menu stated. A pool of kerala fish curry, with beans poriyal on top, piled with two measly pieces of halibut. It tasted exactly like what my mallu friend made at home everyday. The problem was – that’s not what she wanted. 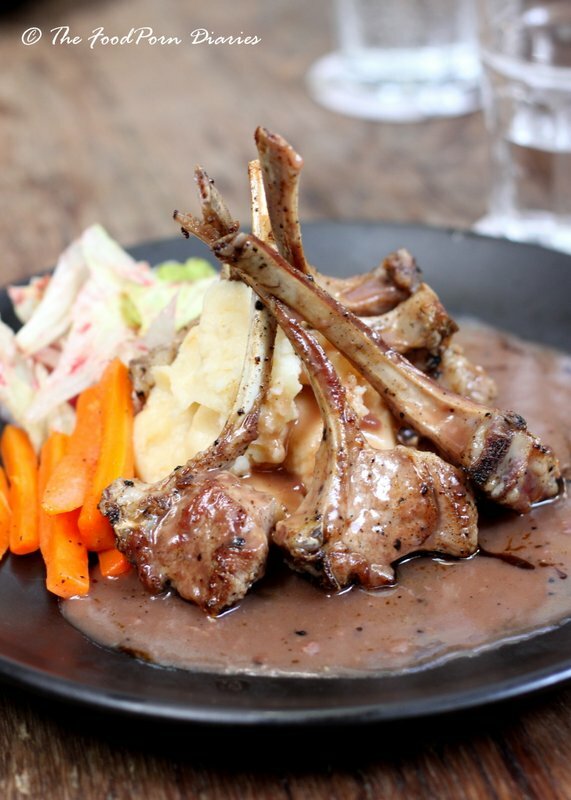 The Grilled Lamb Chops was the hero that tried valiantly to erase the disappointments of the earlier main courses. Four succulent Lamb chops grilled with a rosemary mint marinade rested on some delicious gravy and was accompanied by Mash Potatoes and frizzled (??) onions. This was good and tasty and wholesome. I even shared one chop with the friend who ordered the kerala curry. At this point we had all agreed that we should have been less finicky and ordered the burgers. But we live and learn. Dessert had some interesting choices but a Key Lime Pie with White Chocolate Lemon Domes, Meringue and Lemon Gastric (a whaaaat?) sounded fun. 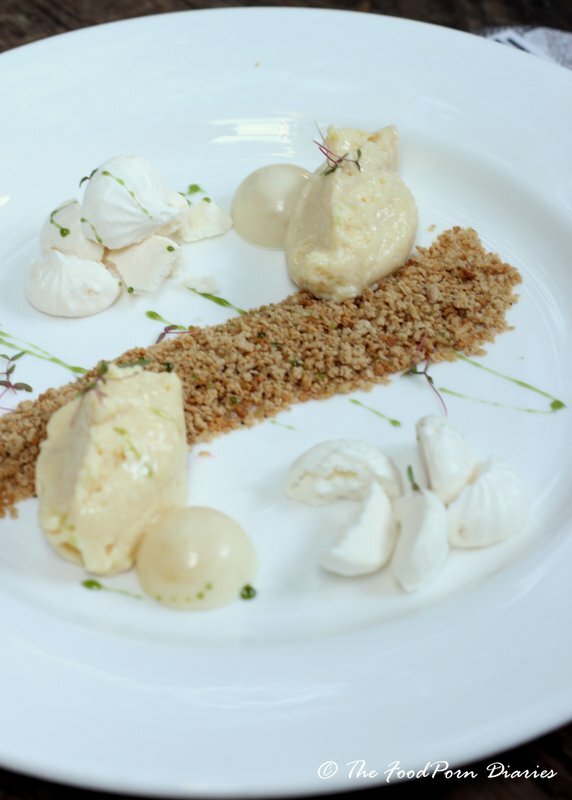 They did a bang up job on all the elements of this deconstructed dessert and I especially like the pie filling which was smooth, airy and just tart enough to leave you wanting more. (The picture does not do the dessert justice – white on white looks good only on Simi Garewal). The Good – The ambience and décor are absolutely fantastic for a night out and the prices are definitely competitive. The Bad – Service is efficient but the waiting time between each course is painful if you don’t have a drink in hand. 12th Main, Indiranagar, Bangalore 560038. Parking: Valet || Cost: Rs.1300/- ++ for a meal for two without drinks.